The grass of the orchard of the Physic Garden is now spangled with the heads of the snake’s head fritillary. Fritillaria meleagris is a species of the flowering plant in the family Liliaceae and has many common names apart from snake’s head (the original English name) including chess flower, frog-cup, guinea-hen flower, guinea flower and leper lily (because its shape resembled the bell once carried by lepers) and several others. It is the UK’s only native fritillary species. 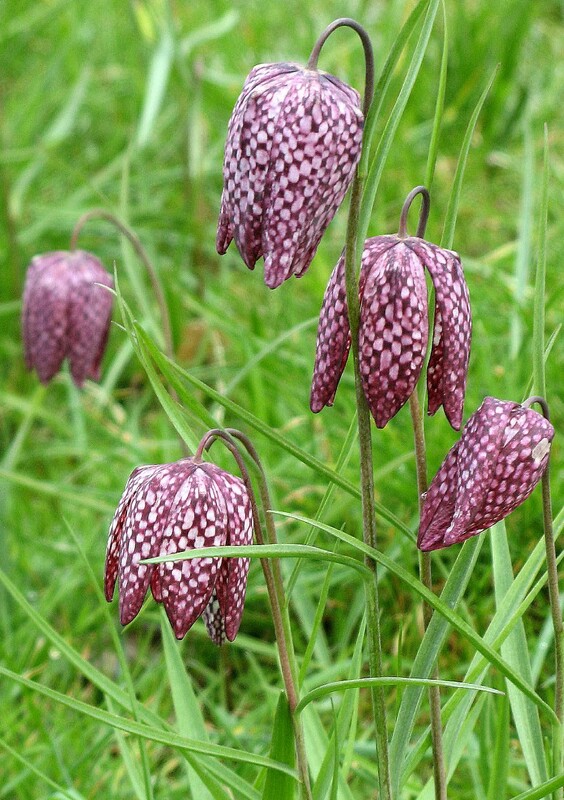 The name Fritillaria comes from the Latin fritillus, meaning dice-box possibly referring to the chequered pattern on the purple flowers. There is also a pure white form. The plant was once abundant in the UK especially in the Thames Valley and parts of Wiltshire. It was collected in vast quantities to be sold in the cut flower markets of London, Oxford and Birmingham. During World War 11 most of the ancient meadows were ploughed up and turned over to the production of food crops destroying much of the plant’s habitat making it now rare in the wild. The plant is possibly poisonous but has not been fully investigated. Some sources suggest it is a cardiac poison but it does not appear on the HTA list of potentially harmful plants.